The romance of an African Honeymoon is legendary. You will fly to Johannesburg, to relax overnight and get ready to venture into the bush the next day. One of Africa’s leading attractions, the Kruger National Park is a premier game sanctuary that covers more than 20,000 square kilometres of land between the Crocodile River in the south and the Limpopo in the north. You will arrive and be met at Mpumalanga Airport and your total bush experience will commence from there. The calling of the bush, the animals providing a view into their special world. You will see a large variety of animals, which will likely include the big 5 of elephant, lion, cape buffalo, leopard and rhino. And you will be staying in luxury during 3 nights of this marvellous experience in the Kruger Park. Next you will be flying to a totally different, but equally new experience. Bazaruto archipelago, a National Park of Mozambique, sustains a diverse range of fauna and flora including forest, savannah and wetland ecosystems The island of Benguerra is a beautiful and unexplored destination. The archipelago is deservedly known as the “Pearl of the Indian Ocean”. Here you will be able to relax in the beauty, but also participate in a range of beach and sea activities as you choose. 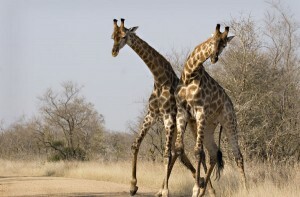 A romantic hideaway from the rest of the world, for 5 days, in one of the relatively untouched tourist areas of Africa. Life memories! Your are headed on Honeymoon and a wonderful safari. Overnight in Johannesburg, to prepare for the bush. A warm welcome at Mpumalanga Airport, and transfer to your accommodation for your first night in the bush, under African Stars. You will experience awesome game drives in Kruger National Park, truly one of the greatest animal viewing places in the whole of Africa. More than 140 resident mammal species, and as well as the Big Five you’re likely to see zebra, wildebeest, giraffe, hippo, crocodile, wild dog and antelope to name a few. Late afternoon your game drive will pause deep in the bush, where you will be served your favourite “Sundowner” cocktail. Upon return to Lodge each night, you will be treated to spectacular meals which may be served indoor or outdoor in a boma. Arrival at Vilanculos International Airport and transfer to your accommodation. The island of Benguerra is characterized by its wildlife, turquoise waters, idyllic beaches and coral reefs. A very exciting retreat. The luxury of the accommodation, the splendour of the beach and ocean – this is your perfect island escape. On your day of arrival, you will receive a 15 minute refresher back and neck massage to get you into the spirit of the resort. Enjoy a Landrover Island drive and a sunset Dhow Cruise as a part of your stay. Complimentary non-motorized water sports are available, as are optional activities including snorkelling, diving, secluded picnics and fishing. You are in honeymoon paradise for 5 days!! Fly from Vilanculos International Airport to O.R. Tambo International Airport (Johannesburg), and connect on to your flight home. With memories and photographs forever! !